Wild animal selfies drive millions of digital clicks and shares, but these critter photos are not just entertainment for the online masses. They are scientific data collected by camera traps: cameras equipped with a sensor—motion, infrared or light beam—that triggers the shutter when it detects an animal moving by. These devices let researchers observe wild animals in their natural habitats while largely staying out of their hair, feathers and scales. In Candid Creatures: How Camera Traps Reveal the Mysteries of Nature, zoologist Roland Kays has collected 613 of the best images from 153 research groups around the world. It's a delightful photo album of wildlife ranging from aardvarks to zebras, with plenty of big cats, bears, primates, elephants and other charismatic critters in between, as well as a comprehensive overview of how camera trap technology is transforming our understanding of their lives. Camera trapping has been around in some form for more than a century. To create his 1,878 images of a horse in full gallop, photographer Eadweard Muybridge connected strings to the shutters of a dozen cameras, which the horse triggered in sequence by breaking the strings as it ran by. In the late 1880s, Pennsylvania photographer (and one-term Congress member) George Shiras created a camera-and-flash system triggered when a wild animal touched a trip wire. His images won a gold medal at the universal exposition in Paris in 1900. Fast-forward to 2006, the year photographer George Steinmetz touched off the field's modern era when he created the first digital camera trap while on assignment for National Geographic. In the decade since, cameras have become more durable, memory cards more capacious and batteries more powerful—a trifecta that has ushered in the golden age of the camera trap. "Modern studies use dozens of camera traps over hundreds of locations to collect many thousands or millions of photographs," Kays wrote. "The camera trap photograph offers a way to measure biodiversity, a testament to life on earth similar to the traditional animal skins and skeletal specimens stored in the collections of our great natural history museums." 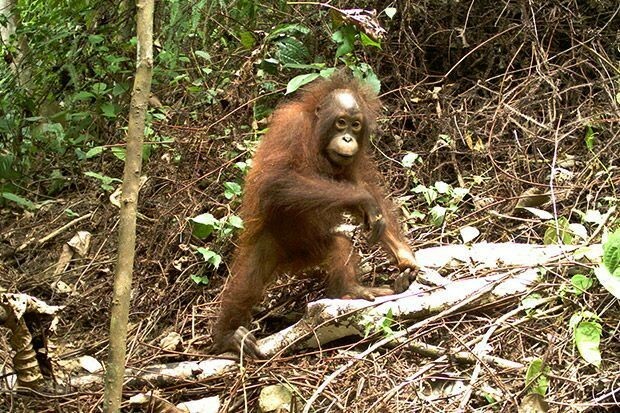 Scientists are learning things about even the most avidly observed species from camera trapping, Kays wrote, while generating the perfect means to engage the public on preserving biodiversity, "Data and images are the two most important results of any camera trap study, working together to help in the fight to conserve animals and their habitats. A Sunda clouded leopard pauses for his portrait in Borneo's Tawau Hills National Park. 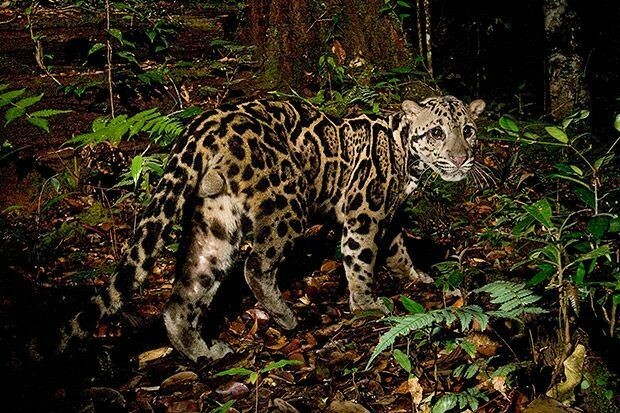 "Clouded leopards are forest animals and camera traps most often detect them in evergreen forests," wrote Kays. The species is "tolerant of some level of hunting, as camera traps showed that they continued to survive in an Indian preserve after the tigers, as well as much of the prey, had been overhunted by illegal poaching." 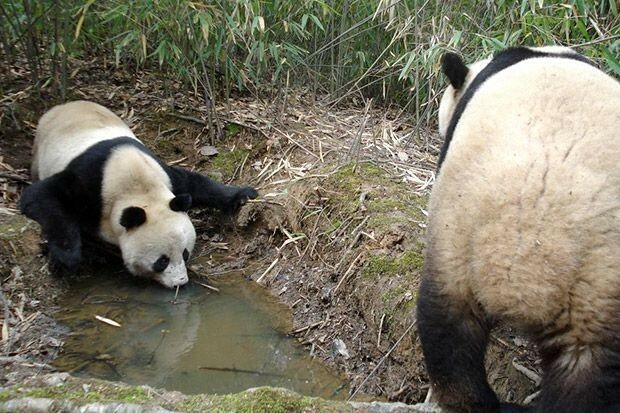 A pair of pandas stop for a drink in a thicket of bamboo, the plant that makes up 99 percent of this species' diet. "With the panda's skid toward extinction apparently halted, conservationists are now looking for sustainable solutions," wrote Kays. "Camera traps are important tools for monitoring their populations within panda reserves … and hopefully will continue to capture cute photos of these animals long into the future." 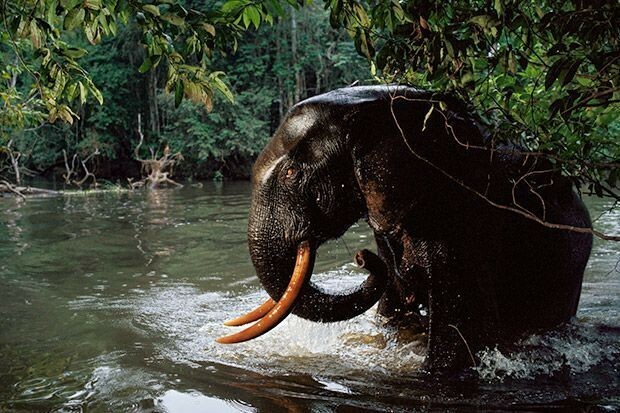 An older adult male elephant comes up from a swim in the Echira River in Gabon's Loango National Park. "Camera traps have been more important for studying forest elephants than bush elephants because they are harder to find and watch in person," Kays noted. "Each elephant has a unique appearance, based on size, ear shape and scarring patterns. By placing camera traps in a regular grid across the forests of Loango National Park, Gabon, Josephine Head and colleagues were able to photograph and identify 139 unique individuals, estimating a density of 0.54 animals" per square mile. 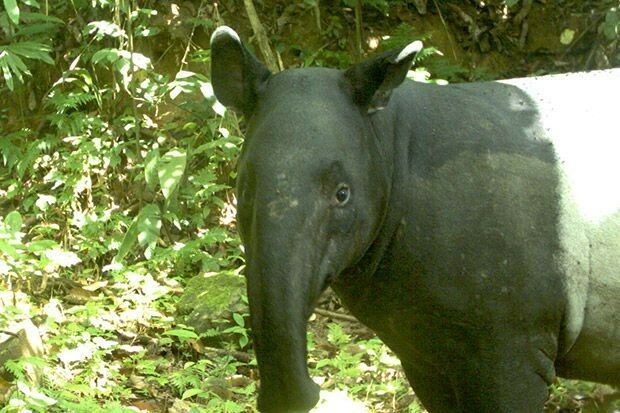 The Malayan tapir has the longest snout of the five tapir species and is "Southeast Asia's least known species of megafauna," wrote Kays. To learn more about this species, which is endangered by loss of its preferred evergreen forest habitat, 37 biologists combined images and data representing "52,904 camera trap days of effort across 1,128 locations in 19 nature preserves." 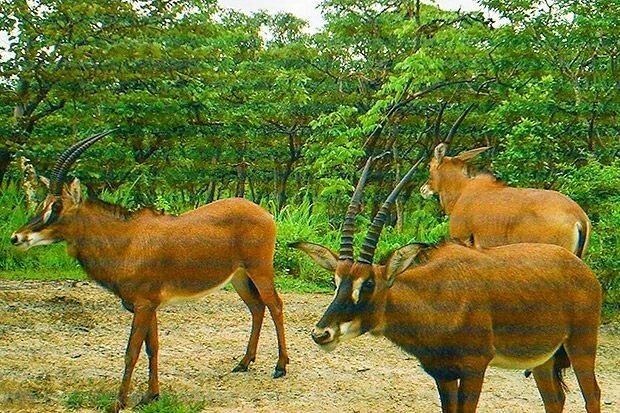 A herd of female sable antelope congregates around a salt lick in Cangandala National Park in Angola, which makes the site a good location for a camera trap. "Unfortunately, poachers have also discovered these animal hot spots and are often caught on camera as they patrol by," Kays wrote. "They have seen and destroyed enough camera traps at this site that scientists now have to climb trees and mount them out of sight." 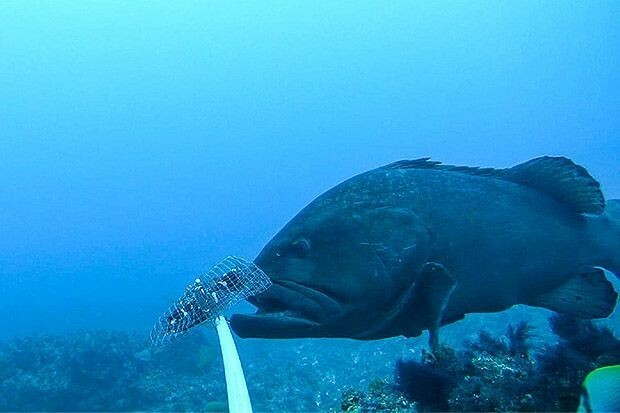 A large adult black cod approaches a baited underwater video station in the rocky reefs of eastern Australia—a "big beautiful fish that also has the misfortune of being delicious," Kays wrote. Overfishing devastated populations of this Australia–New Zealand fish from the 1950s through the 1970s. Its numbers have not bounced back despite more than 30 years of protection. "Out in the deeper waters around rocky reefs some large adults are now seen by snorkelers and photographed by baited remote underwater video stations," Kays continued. "However, young fish are almost never seen, raising concerns over the next generation of black cod." 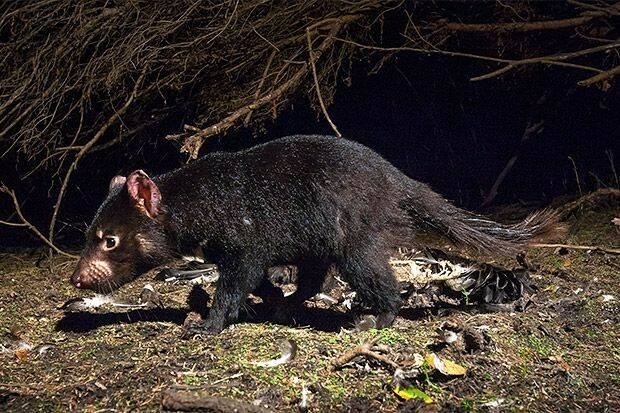 A Tasmanian devil runs away from a bird carcass that served as its recent meal. Found only on the Australian island of Tasmania, the devil population has plunged 90 percent since 1996 owing to a unique, transmissible facial cancer. But camera trapping at one location has buoyed hope for the species, Kays wrote. "[D]evils at Freycinet National Park suffered only a small initial population decline when the cancer first arrived," he wrote, "but the population has bounced back. The tumors can be identified in good camera trap photos, allowing officials to see that it was never common in the park, and that it has declined since 2006." A giant pangolin rears up, showing its fierce claws. Its heavy tail acts as a counterbalance, allowing it to run with very little weight on its front feet, keeping its claws sharp for digging into termite or ant mounds. Rampant poaching of pangolins for their scales, which command large sums on China's black market, has threatened the species' survival. 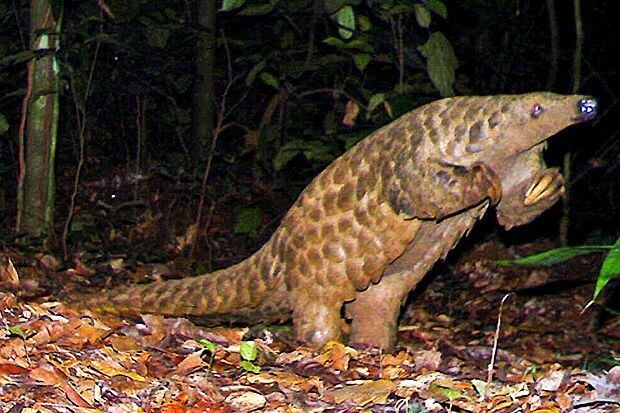 Along with campaigns to reduce public demand for pangolin parts and intensified policing of the illegal wildlife trade, Kays wrote, conservationists "on the ground in African and Asian forests [are] patrolling for poachers and using camera traps to try to determine where the pangolin populations persist." A baby orangutan crosses a gap in the forest to catch up with its mother. Conversion of forests to palm oil plantations has been a major factor in Bornean orangutan population declines. "The species is threatened by habitat destruction and by selective logging," Keys wrote. "Camera trap surveys can map where these monkeys still roam, helping to target conservation efforts." The world's largest primate, weighing up to 600 pounds, the western gorilla is critically endangered thanks to poaching, Ebola epidemics and loss of its lowland rainforest habitat. 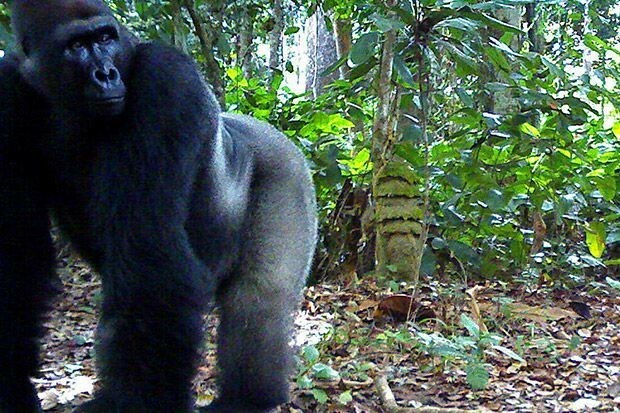 This silverback male gorilla encountered a camera trap in Gabon. "Tracking the declines and recoveries of gorilla numbers over these remote areas is challenging and many traditional methods have since been found to be unreliable or too difficult to scale up," wrote Kays. "A few recent studies with camera traps suggest that they could be a useful tool to help count and protect gorillas," in part because "gorillas have unique faces and can often be identified from photos."